The Dachshund is one breed with six varieties - 2 sizes and 3 coats. 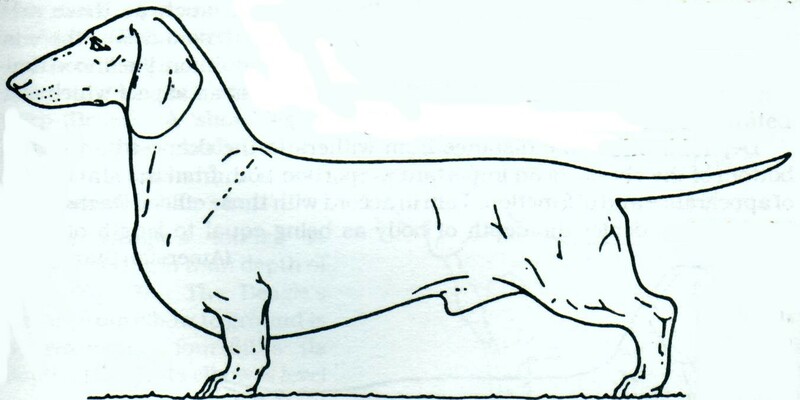 The standard dachshund is a much larger animal than the miniature, ideally at breed standard weighing 20 - 26 lbs. but in reality few would meet this weight. The miniature dachshund is ideally 10lbs but must not weigh greater than 11lbs for showing. The three coats are long, wire and smooth. The smooth would seem to be the oldest of the coats, with some argument over how the long and wire genes made it into the breed. However they arrived, we now have the glamorous longs, workman like wires and elegant smooths burrowing their way into the hearts of all dachshund lovers. The UK breed standard states that the general appearance is one of being long and low but with a compact, well muscled body, bold defiant carriage of head and intelligent expression. The dog should be intelligent, livley, courageous, obedient, faithful, versatile and good tempered. The head should be long wih uniform tapering to the tip of the nose. The slightly arched skull should slope gradually into the slightly arched muzzle. The strong jaw bones are the necessary accesory of a hunting breed. The eyes are medium in size and almond shaped. They must be dark except chocolates which may be lighter, or dapple where one or both "wall" eyes are permissible. The broad ears are well rounded with the forward edge touching the cheek. The only acceptible bite for a dachshund is a complete scissor bite. The head is attached to the body by a long, muscular, slightly arched, graceful neck. The forequarters consist of long, broad shoulder blades set onto a robust ribcage. The upper arm and shoulder blade being the same length. The forearm is short and strong in bone, inclining slightly inwards, moderately straight in profile and covering the lowest point of the keel. The front feet are full, broad, deep and close knit, with strong nails and thick firm pads. A long and full muscled body, level, with sloping shoulders and slightly arched, short and strong loin comes next. The breast bone should be strong and very prominent. The ribs should be well rounded and extend well back. The underline should merge gradually into the abdomen. The hindquarters are the driving force of the animal. They need to be well muscled with full rump, long croup, and strong pelvis. When viewed from behind the legs should be straight and parallel. Hind feet are smaller and narrower than those at the front. The tail continues the line of the spine, without kinks or twists and should not be carried above the level of the back on the move, or touching the ground at rest. The smooth coat is dense and smooth. The skin is loose and supple. The soft and straight, or only slightly waved, long coat should resemble that of an Irish Setter. Abundant feathering should be apparent on the tail (where it obtains its greatest length) the neck, underparts of the body, behind legs and outside of the ears. A short, straight harsh coat covering a dense undercoat is required of the wire. The chin and eyebrows are bushy, and the ears almost smooth. and a few others I'm sure I've missed . . . . . The only restriction is that the dapple should be evenly marked all over, and is the only colour with permissible white patches. Nose and nails should be black in all colours except for chocolate where brown is permitted.